Rustic house located in a small vineyard of the property, near Los Quemados in the municipality of Fuencaliente (Los Canarios). With stunning sea views and terraces with SW orientation to enjoy the best sunsets. In the best area to start multiple hiking or cycling routes. 5 minutes from several natural beaches and fishing areas. Old cellar rebuilt and restored as a country house. 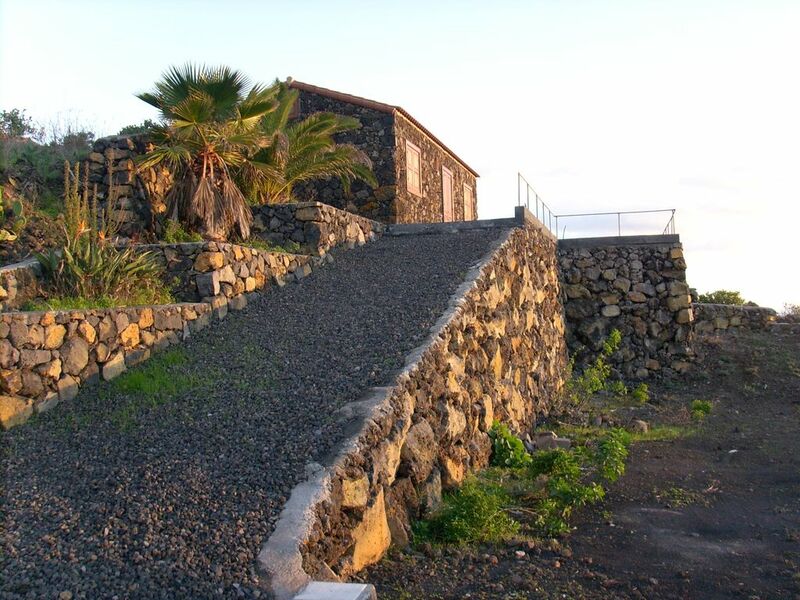 Canario type, wide walls and lined with original volcanic stone. It consists of a large living room with dining table and sofa that can be made bed for two people. It has in the same space the fully equipped kitchen. With hi-fi stereo and T. V.
Bathroom with shower and washing machine. Sheets and towels are included. Large outdoor terrace with furniture, sun loungers, wooden porch, barbecue and shower. After traveling to this island we fell in love with its landscape, environment, good weather, sea and the most important thing: its people. With a view to a future retirement we build this dream in an old winery that we lovingly restore in the middle of a vineyard and in the middle of a park of special protection. Rural environment. Loneliness. Spectacular views of the sea. Sun and ideal temperatures. Starry nights Endless walks. You can not miss the sunsets from our terrace and recreate at night with the most famous starry sky in Europe for its brightness and clarity. The sunsets, the stars and the light on the sea in the mornings will stay with stay with us forever. Wonderful place to stay especially if you appreciate peace and quiet The house was very well equipped and comfortable. Going in and out of the property was challenging, even in a small car and needs a confident driver. Le grand plus de la villa, c'est la terrasse. Beaucoup d'espace, des transats, possibilité de manger dehors et une vue SUPERRRRRRRBE à 180 degrés sur l'océan. Le soir, spectacle coucher de soleil et la nuit tombée un ciel nous dévoilant des milliers d'étoiles. Le confort intérieur est agréable. Pour cuisiner, il manque un four. La route pour arriver à la villa est très pentue(les 20 derniers mètres), mais passée la surprise on s'y habitue vite. Il est dommage qu'il n'y ai pas un magasin et une boulangerie accessible à pied. Un très bon accueil. La villa était garnie pour Noël, une bouteille de cava était offerte. Manu qui nous a accueilli, parle français et il nous a donné tous les renseignements pour les magasins et les restaurants. En bref, une location que je recommande si vous aimez le calme et une belle vue sur mer. Etwas abseits gelegen , grosse Terrasse mit herrlichem Blick, im Prinzip total ruhig einzig das Hundegebelle hatte uns gestört. tolle Lage in Fuencaliente mit Blick aufs Meer, riesige Terasse, nette Vermieter. Toller, freier Blick über das Meer, saubere, ordentliche, helle Unterkunft, großzügiges Gelände. Einziger Wermutstropfen waren die Mottenkugeln. Die Bettdecken in den Schubladen mussten wir erst einmal gründlich lüften.